In addition to Mailchimp's built-in tracking for opens and clicks, you can enable third-party tracking options in the Settings & Tracking section in the Campaign Builder. If you use Google Analytics on your website, add Google Analytics tracking to your Mailchimp campaigns to track clicks from your campaigns all the way to purchases on your website. If you want to track purchases, you'll want to be sure Google Analytics is set up to track conversions. If you'd like to add Google Analytics tracking to your Mailchimp campaigns manually instead of using our built-in integration, use Google's resources to create custom tracking code. Once you've added your Google Analytics tracking code and sent your Mailchimp campaign, you'll be able to view the campaign stats in your Google Analytics account. When you connect your online store to Mailchimp feature, we make it possible to track individual visitors to your website from your Mailchimp campaigns, capture order information, and pass it all it back to Mailchimp. From there, you can view purchase details, conversions, and total sales on the Reports page in your account. You'll even be able set up segments based on your subscribers' purchase activity. If you're currently using ClickTale to get an in-depth view of visitor interaction on your website, you can add ClickTale tracking to your email campaigns to gain insight into how subscribers interact with your email content. Once the tracking has been added you can log in to ClickTale to see the reports generated from your sent campaign. You can pass certain subscriber data from Mailchimp back to Salesforce. 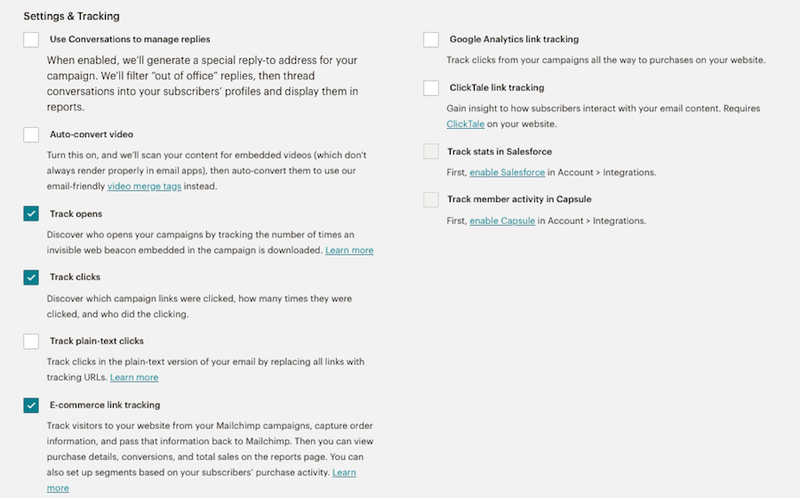 Once you've integrated your Mailchimp account with Salesforce, we'll add in tracking options in the Campaign Builder. Once you've turned on tracking for Campaign Stats and/or Member Activity in Mailchimp, the information will be passed from your Mailchimp campaigns over to your Salesforce account. You'll be able to monitor these stats under the Notes & Attachments section in Salesforce. At this time we cannot pass new subscribers added directly in your Mailchimp account back to your Salesforce account. We will only be able to pass back subscriber reports. Follow users from emails to online purchases with Google Analytics and Mailchimp. Learn how to set up conversion tracking, use built-in analytics, and more.